Are you ready to go green with your skin and haircare? Take control over what goes into your personal care products and make your own! 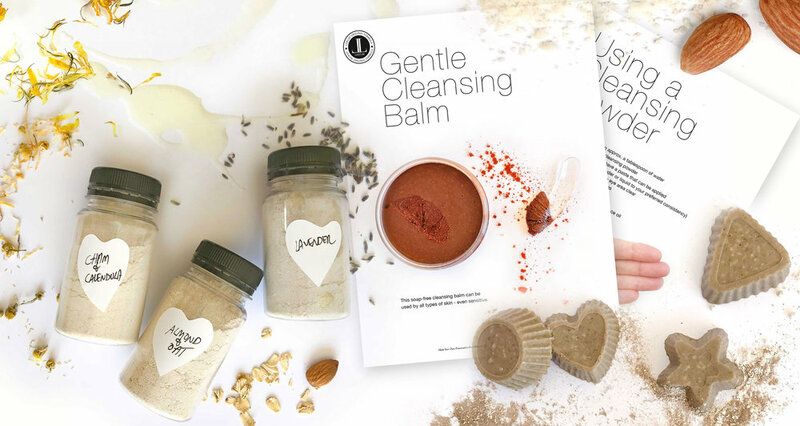 This 180 page course-in-one-e-book is a complete beginners guide to making quality skin and haircare products using easy-to-source, inexpensive ingredients. Every ingredient has been carefully selected for effectiveness, multi functionality, easy accessibility, and reasonable cost. Every formula has been tried and tested to ensure a successful result – even for absolute beginners. If you can follow a cooking recipe, then you can make the products in this book. Using pure, natural, locally sourced ingredients to make your own cosmetics gives you the greenest, cleanest skin and haircare with the smallest carbon footprint. Even though there are no added preservatives, the products in this book are formulated to have a shelf life of several months. The only exception to this is a few fresh food masks (which are made for immediate use and maximum skin-loving benefits). You probably already have most of the necessary tools and equipment for making these items in your kitchen. Are you ready to go green? You don’t even have to wait for shipping - delivery is immediate after purchase! Want to learn more first? Please scroll down for more detailed information about what’s in this book. Perhaps you are looking to get back to basics, are curious about whether ‘going green’ is right for you, or just want to try your hand at making a few products. Whatever your reason, I think you will find making your own cosmetics is rewarding and beneficial for your skin, hair, and even your pocketbook. This book is 100% beginner-friendly, but also useful for more experienced artisans interested in working with formulas employing hurdle technology as a preservation method. The deodorants in this book were developed to accommodate the many requests I have had for a natural, preservative-free deodorant that provides all day protection. No small order, but I believe I have fulfilled everyone’s requested requirements. They have been trialled by a small group of willing (family and friend) testers where they performed with an average deodorising time of 14,5 hours – even through an unusually long heat wave. The deodorants in this book are 100% botanical and easy to make. They have a shelf life of approximately 6 months. This 180 page E-book is richly illustrated with 39 unique formulas, 12 easy to follow how-to's, loads of tips, an entire section on knowing your ingredients, and much more. And even more - scroll down to see the entire Table of Contents!